Porous NiTi is produced by sintering pre-alloyed NiTi powders with NaCl powders which are removed to create 40-60 vol.% macro-pores which are open to the surface, blocky in shape and 100-400 µm in size. The micro-porosity present between the NiTi powders is infiltrated by an in-situ created NiTi-Nb eutectic liquid which, after solidification, densifies the NiTi powders into dense struts. This new method (1) allows for separate control of the macro-porous structure and the densification and composition of the NiTi struts. A related new method (2) uses NiTi powder compacts containing Nb wires as spaceholder. When are heated above 1170oC, each Nb wire reacts with adjacent NiTi powders to form a eutectic liquid which wicks into the space between the remaining NiTi powders. This creates a macro-pore at the location of the Nb wire while eliminating the microporosity between NiTi powders which is filled with a NiTi/Nb eutectic phase after solidification. This novel method produces - in a single step and without applied pressure - dense NiTi with elongated pores suitable for shape-memory or superelastic applications such as bone implants, dampeners and actuators. Bansiddhi, A., & Dunand, D. C. (2011). Niobium wires as space holder and sintering aid for porous NiTi. Advanced Engineering Materials, 13(4), 301-305. Bansiddhi, A., & Dunand, D. C. (2011). Processing of NiTi foams by transient liquid phase sintering. Journal of materials engineering and performance, 20(4-5), 511-516. 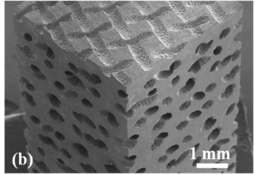 A new process is developed for fabricating arrays of micro-channels in shape-memory NiTi for bone implant applications, with a tailorable internal architecture expected to improve biomechanical compatibility and osseointegration (1). Porosity is created by electrochemical dissolution of parallel layers of steel wire meshes embedded within a NiTi matrix during hot pressing of NiTi powders. 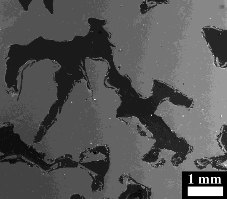 The resulting NiTi structures exhibit parallel layers of orthogonally interconnected micro-channels (350-400 Âµm diameter, 24-34 vol.% fraction) that exactly replicate the steel meshes. These NiTi structures with replicated networks of micro-channels have excellent potential as bone implants and scaffolds given: (i) the versatility in channel size, shape, fraction and spatial arrangement; (ii) their low stiffness (15-26 GPa), close to 12-17 GPa for cortical bone; (iii) their high compressive strength (420-600 MPa at 8-9% strain); and (iv) their excellent compressive strain recovery (91-94% of an applied strain of 6%) by a combination of elasticity, superelasticity and the shape-memory effect. Neurohr, A. J., & Dunand, D. C. (2011). Shape-memory NiTi with two-dimensional networks of micro-channels. Acta biomaterialia, 7(4), 1862-1872.